We are a large and diverse association of people based in the British Isles and Continental Europe. 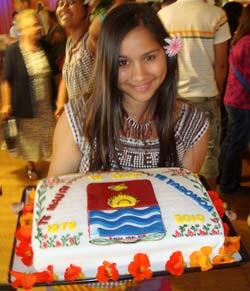 We all have family, social, cultural and/or (past) employment links to the Republic of Kiribati. This is an island country in the central Pacific Ocean formed from the Kingsmill and the Gilbert Groups of islands: they formed part of the Gilbert and Ellice Islands Protectorate of Great Britain and the Gilbert and Ellice Islands Colony. Look here for more about Kiribati. The Association was set up in April 1994 by several families of mixed marriage between former colonial staff and aid workers from Britain, and I-Kiribati and Tuvaluans. Their aim was to bring together other similar families and other I-Matang or Palagi who had lived and worked in or have other links to Kiribati and Tuvalu, and to support I-Kiribati and Tuvaluan visitors while they are in Europe. In August 2006, the Tuvaluan community decided to branch off to form their own organisation, and the name of the organisation was changed. The Association is a non-profit organisation and its main activities are social and cultural. It stages an annual get-together for all members and friends in July, a small part of which is given over to an annual meeting of members. This annual meeting appoints unpaid officials who form the General Committee and holds these officials accountable through a reporting process. The Association and its Committee have relied in the past on an annual newsletter, published in November, to communicate with members, but from 2003, this is being supplemented by this web site. The Committee welcomes any proposals from all members for the betterment of the Association. To welcome visitors from there to Europe and to ensure they take home happy memories. Offering assistance and hospitality to I-Kiribati friends visiting the United Kingdom, Ireland and continental Europe. The main purpose of the annual get-together is to commemorate in a celebratory way, with te batere (dancing) and feasting, the days when the Republic were established and I-Kiribati shrugged off the manacles of colonialism, namely 12th July 1979. The get-together usually extends over a weekend, with participants camping, caravanning, bed and breakfasting, and hoteling. The size of the get-together increases every year, as our families grow, as more people from the old days hear about the Association and want to meet old friends or people who have shared their experience of living on the islands, and as returning recent visitors to the islands join us. The other significant activities of the Association in the rest of the year revolve around performances by and practice sessions of the te batere group. Mostly, the children and young adults comprise the dance performers and the old women and men provide the singing and percussion accompaniment. Performances in recent years include slots at the Millennium Dome and the World Festival of Music, and occasional performances for the Pacific Islands Society of the United Kingdom and Ireland. Membership is by subscription, which entitles you to a copy of the Association’s annual newsletter, “Te Buu”, members list and any other information that may be of interest to our members. Membership runs from 1st January. Look here to join the KTA. You can read our Constitution, find out about membership of the KTA and read news items and features (see the box on the right). You can also read our annual Newsletter, ‘Te Buu’ (the latest edition is reserved for KTA members only). If you want to know more about Kiritbati, look here; there is also a small collection of web links – if you know of other useful links, please let us know. For more about this website and how you can contribute to it, see the Post called This New-Look Website. There is also a Facebook page for members.